When it comes to building a life of freedom and owning and running a lifestyle business, there are a few things that must be understood, before choosing what business to start, what products to sell and how to structure your business. This episode is dedicated to the freedom-lovers! For those of you who want to own a business that you can run from anywhere in the world, one that gives you the freedom to choose your hours and make money without the need of your physical presence. In this episode of the Wild Woman Run Free podcast, I’ll teach you the one thing that I learned, that changed my views on how to make money. This understanding, totally changed the way I set my goals in business and in life and without it, I wouldn’t be where I am today. For me, living a fulfilling and meaningful life, is when you have the freedom to do anything that you want to do, without any restrictions. That means being able to work on your passions, follow your purpose and live a life of freedom in all ways possible, so that you have the time to spend with your loved ones whenever you want without the feelings of guilt or having to compromise! So today, I want to take you through the difference between earning active income vs earning passive income and how starting out with this knowledge, can set you up to plan a business that fits in with your life and your ultimate goals. This crucial knowledge, can affect the type of business model you choose, the products and services that you want to sell, the way that you market, even to the way that you build your teams. This knowledge can also benefit your whole life and the life of your loved ones! So it’s an extremely exciting topic…and I can’t wait to share it with you! Awesome! What are we waiting for!? I’ll tell you a little story… about 6 years ago, I was working in a corporate environment, stressed, I worked long hours and spent at least 3 hours getting to and from work door to door. Not only that, I had to deal with office politics and I wasn’t doing what I loved. Two things changed for me around this time. The first major thing, was that I was pregnant with my first baby and I realised that I didn’t want this life anymore! I knew in my heart that I wanted to be there for my little one, and the thought of leaving her at 6am and coming home at 8pm in the evening, was non-negotiable. So I started to look into starting my own business. The one main priority for me though, was that I wanted to start a business that didn’t require my physical presence all the time, one that I could do around my family and one that has the potential to make uncapped income. Now at the time, I didn’t really know what passive income was. You hear about it on occasion, but it wasn’t explained to me, until I went in search for some business ideas. And what I learnt stoked the fire in my soul and I’ve never looked back since. So today, I want to explain to you the simple way of how I learnt the difference between earning a traditional active income vs earning a passive income. And why passive income, in my mind trumps everything! Ok so what is active income? Active income, is income that you make while trading time for money. I’ll give you an example… my mum used to be a registered nurse. She worked close to 50 hours a week and she got paid a capped income from her employer. Throughout her time there, she accumulated holidays and a certain amount of sick leave, like we all do in a traditional job. The disadvantage that my mum had however, was that she was never able to take time off to follow her passion of travelling. She would dream about travelling Europe for an extended period… but could she do it? No. She worked for 38 years and during that time, she was able to take a short holiday here and there, but she was never able to achieve her dream. Why? Because the disadvantage of having a job and earning active income, is that when you stop working your income stops flowing too. And for most of us, we can’t afford to live, without an income. Ok, so with that in mind…let’s take a look at the various ways to start a business. You will end up trading your time for money. Each day, you max out at 5 hours a day…. And you get paid a certain amount of money from your students. This traditional business, is just like a job. The only difference is, that it’s yours. But even though its yours, you are still trading your time for money and you still need to be physically present to run your business. The main disadvantage of having a traditional business, is like I mentioned you’re trading your hours for dollars. This means that if you want to take off on a holiday for a few months, or take time off to look after your children… your income or your whole business will suffer. So you won’t necessarily achieve the lifestyle freedom that you want. So what about passive income? Ok, so passive income is income that you make, by putting in the hours initially… and earning income over and over and over again with little effort to maintain it. An example of this is when you write a book. Let’s say you’re an author and you write this amazing book on personal development. It may take you about 6 months to get your thoughts down on paper, edit it and get it published. When you publish that book however, you receive income right? And when someone purchases the book, you get a percentage of that directly deposited into your bank account. This means, you can make money when you are not physically present and you can make money while you are sleeping. Now that’s passive income! And it certainly is achievable! It’s not like an impossible pipe dream. Let’s say you want to start a business that brings you passive income. What kind of opportunities are out there for you? Well, you could do a wide variety of things. You could sell e-books! Spend 1 month writing an ebook… invest the hours required to complete the ebook and then sell it on Amazon time and time again. The only thing required here is to market the ebook. Or better yet, maybe you’d like to teach! You might have experience in photography… for example and you want to sell online digital courses. You put the course together… it may take you 3 months… but after that, you can sell your courses for $97 each! That income you make from selling that photography course… is passive income in the bank. Now the beauty about starting a business like this, is that you can start it with small overheads. You don’t need a team of people to start making passive income. You can work from anywhere you want and you’re not a slave to your business. You have no restrictions, you can make uncapped income and the ultimate thing is, that you don’t need to be working a million hours, just to get paid. You can spend more time living your life and your passions, whether it’s doing something creative… or seeing the world! Now doesn’t that sound like a plan!? In saying that though, I’m not saying that earning an active income isn’t good. In fact, I believe you need to earn active income first, to really get good at earning passive income. 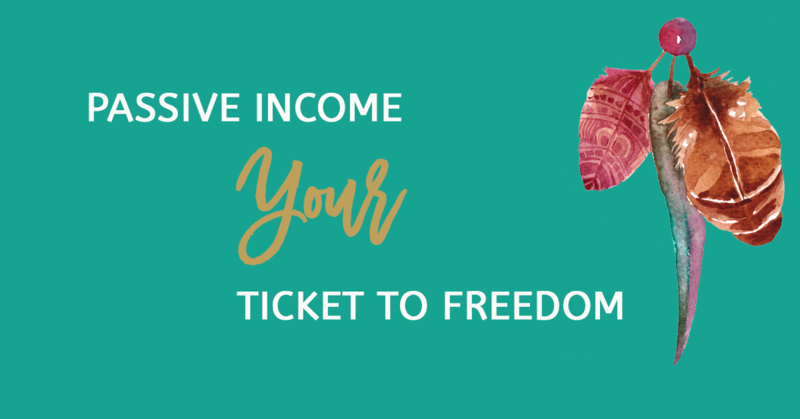 By earning active income, you’ll accumulate skills and experience that can help you on your road to freedom. So active income, is a good thing! I’m also not telling you that starting a business that earns passive income is easy. You still need to put some work into it! For any business to thrive, you need to put a lot of work and effort into getting it off the ground! So it’s not a get rich scheme. However, if freedom and lifestyle is what you’re looking for, do some research and see what kind of business you can start that can produce passive income. You’ll never know where this road will lead and your family is going to love you for it! So ladies, if you loved today’s episode, please feel free to leave a comment below. And if you could take a couple of minutes out of your day to subscribe and review the Wild Woman Run Free podcast on iTunes or Stitcher, I would really appreciate it. Before I go, there are some very exciting things in the making for Wild Woman Run Free. 2017 is definitely going to be a massive year for us! For those of you who want to kick start the year with a bang – especially those who want to start a business that they love… you’re going to be extremely thrilled about what I have in store for you. So stick around for the announcement in January! To our prosperity and freedom! May you all have a wonderful time leading up to this festive season. Until next week! Live Wild, Live Free, Wild Woman Run Free.